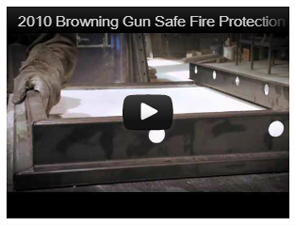 Here are several videos to help you understand more about buying a Browning ProSteel Gun Safe and the industry leading security, fire protection and ease-of-use features that set Browning ProSteel Gun Safes apart from the competition. If you own guns, you need a gun safe. But not all gun safes are the same. Different safes offer more or less protection, depending on the features included in the safe. 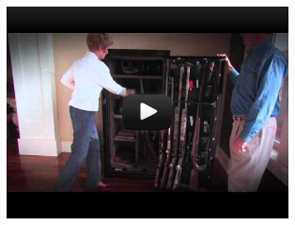 Here is a video to help you get the right gun safe for you. Security is one of the biggest reasons to get a gun safe. Pry-stop end bolts, force deflector and UL ratings are just some of the industry leading security features that set Browning ProSteel Gun Safes apart from the competition. Steel thickness, fireboard insulation thickness and no weak links are the key factors for safes to defend against the devastating effects of fire. 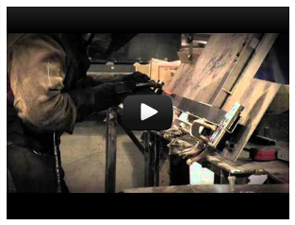 Watch the video to see how Browning ProSteel Safes meet and exceed these things for the best fire protection. 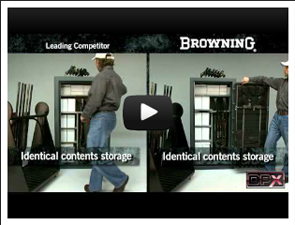 If you ever wondered why you should buy a gun safe with the patented Browning ProSteel DPX door storage system, this video will put your questions to rest. Watch it and wonder why anyone would want less. You get 42% more long gun storage. It is just that simple. 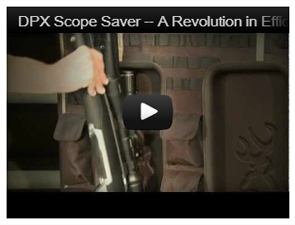 The DPX Scope Saver, only available on Browning ProSteel Safes, is neatly molded into the door panel and creates space for optics mounted on long guns. This unique, one of a kind rack maximizes long gun storage and protects your optics from bumps that occur when moving guns in and out of your safe.